The Lao Peoples Democratic Republic (Lao PDR) is a land-locked country with an economy that is overwhelmingly agrarian in character. Approximately 85% of the 4.3 million people live in rural areas with agriculture as their main occupation and about 65% of GDP is derived from agriculture and forestry. About 300,000 families (1.8 million people) are engaged in shifting cultivation, a practice that seeks to meet family subsistence needs and provide some cash income. Shifting cultivation brings with it, however, certain serious environmental and social problems. Lao PDR is the major producer of Siam or Lao benzoin, a balsamic resin obtained from the yan tree (Styrax tonkinensis), which is native to Southeast Asia. Annual production of Siam benzoin, one of the two types of commercially produced benzoin, is around 50 tonnes. In some years Lao PDR is the sole producer of benzoin, although Viet Nam is believed to intermittently produce much smaller amounts. The second type of commercial benzoin, Sumatra benzoin, is derived from two other Styrax species: S. benzoin and S. paralleloneurum, both also Southeast Asian trees. Indonesia, specifically north Sumatra, is the only producer of Sumatra benzoin. The scale of production of the two types of benzoin is very different. Annual production of Sumatra benzoin is of the order of 1,000 tonnes. This production figure for Sumatra benzoin is based on Indonesian export data. It is important to note that some of this benzoin contains damar, which is used in the manufacture of benzoin block. The actual figure for genuine benzoin could be as low as half this, i.e. about 500 tonnes. Benzoin is used chiefly for incense purposes and in the flavouring, fragrance and pharmaceutical industries. The higher quality Siam benzoin is used mainly in the manufacture of fine fragrances. Production of benzoin in Lao PDR is centered in the mountainous, northern provinces of Luang Prabang, Phong Saly, Houaphan, and Oudomxay, where Styrax tonkinensis trees are managed within the shifting cultivation cycle. The shifting cultivators in Luang Prabang, Phong Saly and Oudomxay provinces extract the resin from trees during the dry season. Luang Prabang is the chief province for benzoin production; there are some 3,000 ha of styrax forests above 700 m elevation in two districts of the province. Benzoin production, integrated into the shifting cultivation cycle, forms an agroforestry system combined with upland rice cultivation. For example, the villagers of Ban Kachet in Nam Bak district of Luang Prabang province apply a rotation of 11 years, producing upland rice in the first year and benzoin during the following 10-year fallow period. This type of land use can maintain forest ecosystems and offers an excellent rehabilitation method for degraded forests damaged by shifting cultivation. In other villages, however, a shorter rotation period of 5-7 years is applied. Under this regime soil degradation has been inferred from a decline in rice yields. Although benzoin production in Lao PDR is relatively small, at least in comparison with that in Indonesia, it provides a welcome source of cash income to the people who collect it. Benzoin also makes a small contribution to the national economy through foreign exchange earnings. A brief introduction to the background of the project is appropriate. As forestry specialists are well aware, the tropical forests of the Asia-Pacific Region are being threatened by a continuous process of degradation and deforestation. Lao PDR is one of the countries that has been affected by this process through the 1980s and 1990s. In October 1989, the Lao government drew international attention to major problems in its forestry sector - a serious environmental crisis and further impoverishment of rural communities and people living around or inside the forests, in particular in watershed areas affected by intensive practices of shifting cultivation. In response to a request by the Lao government, FAO reviewed the forestry sector through a Tropical Forestry Action Plan (TFAP) exercise during 1989-1991. A set of recommendations was submitted to the government, along with several forestry project proposals. Many donors began to formulate projects based on these proposals. The government also requested FAO to formulate forestry projects, in particular in the field of watershed management and non-wood forest products (NWFPs). Recognition by the Lao government that problems of shifting cultivation needed to be addressed, and that promotion of non-wood forest products could contribute to finding a solution, highlighted the benefits that would derive from improved benzoin production. This recognition facilitated the commencement of project formulation work in July 1992. An FAO review of the countrys NWFP resources concluded that the improvement of benzoin cultivation, processing and marketing should be one of the top priority subjects. Following the preparation of a draft project proposal on benzoin, a second mission was carried out in January 1994, in close collaboration with the Department of Forestry (DoF). 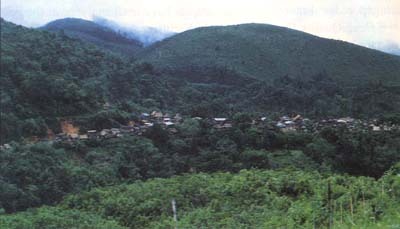 The mission studied benzoin production systems combined with shifting cultivation practices in the field, and identified a suitable project site at the village of Ban Kachet in Nam Bak. The site was chosen because soil degradation, related to declining upland rice yields, was being experienced ¾ and there was easy access to the village by road. After the addition of information collected in the field, the project document was finalized by DoF with support from FAO in March 1994. The project identified two key issues: 1) how to provide effective alternative income sources to shifting cultivators; and 2) how to reduce the negative impacts of shifting cultivation. The project also identified the need for a broad rural development concept to improve benzoin production, processing and marketing. 3. to promote agroforestry and rural development through a benzoin utilization programme in the country (socio-economic and environmental aspects). The project achieved many things in pursuit of these objectives. However, much work still remains in the hands of Lao government officials, including DoF foresters, as well as villagers, benzoin traders, researchers, and other NWFP-related project staff to meet challenges of the future. The project implemented many activities during its 2-year implementation period. These ranged from the improvement of silvicultural treatments, tapping methods, and agroforestry trials, to a socio-economic survey, benzoin market studies, study tours and chemical analysis of benzoin samples. These were all new activities that had not been conducted before. There have been some interesting results from these activities, and more are expected from the on-going follow-up and future activities. A variety of technical advances, including those relating to silvicultural treatments, tapping methods, genetic improvement work, selection of high yield elite trees, healthy and resistant characters against pests and diseases, seedling propagation in nurseries, and socio-economic and benzoin marketing survey results, were presented at a workshop held in May 1998, and publicized in its proceedings in July 1998. A number of recommendations were also made at the workshop and these are detailed in Chapter 10 of this monograph. Two subjects meriting special attention are processing and marketing of benzoin - the most crucial factors in determining the future of Lao benzoin and how much it can contribute to improving the economic situation of Lao villagers. Experts contracted to the project conducted a series of studies on the benzoin markets in Lao PDR, Indonesia, Singapore and France. Benzoin samples have been analyzed at the Food and Drug Quality Control Centre in Vientiane to facilitate improvement of tapping methods, grading systems and quality control. Results of these studies are incorporated into this publication. Project study tours to Viet Nam, Singapore and Indonesia provided vital information to the participants. Unfortunately, the project period of 2 years was not long enough to fully achieve the initially targeted objectives. However, the Lao government is keen to follow up the project activities. Outputs from the project are mostly in the form of English-language documents. Some of them have been translated into Laotian for the benefit of the Lao people. In principle, the documents are government property, although the government has placed them in the public domain. In reality, however, it is not easy for non-governmental people to obtain copies. There is, however, recognition of the importance of sharing the information generated and the experience gained by the project. This is the reason for this publication, Monograph on Benzoin. The project has opened a new horizon for Lao benzoin and shown what can be done and should be done in the future. It is hoped that this publication will enable anyone concerned and/or interested to assess new opportunities and continue efforts to achieve the final project goals. By attaining greater appreciation in the international market, benzoin production in Lao PDR can provide a good opportunity for off-farm employment and an income source for rural communities. It will not be an easy task, but this should not deter efforts to develop benzoin resources and process benzoin resin for new and expanding markets. Both FAO and the Lao government have ranked NWFP development as a top priority in conjunction with rural development for environmentally sound, economically viable, and socially acceptable forest resources management and utilization. Photo 1.1 The project village, Ban Kachet.